Meg threading our 10’ loom, Gladys. Formerly a weaver at Lark Textile Design, Meg Lehinger was the first employee of True North Textiles. With four years at True North Textiles under her belt, Meg has recently been promoted to Production Manager. She brings a lot of care, consideration, and kindness to her work, so she is a fantastic point person for Amy Tyson, our CEO and lead designer. In addition to all the weaving, backing, and other production tasks that everyone at True North Textiles does, she is also in charge of imparting the bigger picture from Amy to the team while Amy is out visiting suppliers and showing our rug designs. What drew you to weaving at True North Textiles? Interior design and home interiors. I love interior design. I thought True North Textiles would be a great opportunity to be a part of custom designing interiors. Even if it’s just the rug, I like knowing that we’re a part of a bigger picture of interior design. Do you do any interior designing? I’ve been passionate about interior designing since I was a little kid. I can’t say I’ve done anything professionally with interior design, except my own home. Like hobby interior design. Just a lot of ideas stored in my brain. I think it’d be fun, professionally. Meg at the sewing machine. How often do you change your house? I did just last weekend. I decided to change around my whole house, switching all the rooms this weekend. I will move the couch to the opposite wall about every other month. What does a Production Manager do? They facilitate the system so that everyone knows what needs to get done and ensures that were all on the same page. I’m assisting Amy with making sure that things are being done properly. I double check what Amy has done and relay the message to the rest of the team so that we’re all aware of what’s going on. At least, that’s my goal. I don’t want anyone to feel that were just being told, “Do this. Weave 36 feet, and you’re done.” I think it would be great if we could all understand what the bigger picture is for that 36 feet. Is it by chance that you are so involved in the yarns—ordering, organizing, checking—or part of the production management? Right now, we’ve got so many different colors of yarn that it's a little hectic. I think its nice that just one person orders the yarn right now. We don’t want too many people trying to do the same task because then things might overlap or be unnecessary or one thing gets left undone. But down the road, I think we’re all going to be ordering yarn. And we’re all going to be doing the same tasks. But for now, it seems like we're just trying to put systems in place so that it makes sense for everyone. Meg weaving on our largest loom, Thor. What is your favorite part of the rug-making process? I like the backing and finishing. I like weaving. That’s hard because I really like the whole thing. There isn’t one part of the process that I don’t like. I even kind of enjoy it when there’s a problem. I don’t want there to be errors or reasons to problem solve, but I really enjoy when there is. It’s a fun challenge to try to resolve. But the backing and the finishing are also fun, just to see it in its final form. The weaving is fun because it's the actual pick by pick, even though its hours. It’s hard for me to enjoy the final piece without having done the middle work. There’s so many different steps. You kind of have to enjoy it all to enjoy the final product. 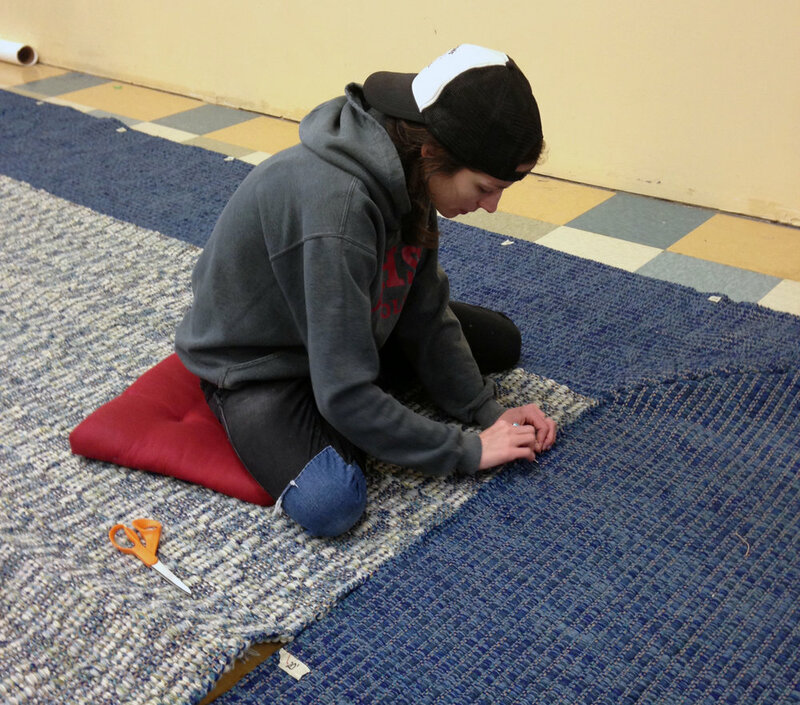 When you’re weaving, do you like a small rug or a big rug more—like a 4’x6’ or a 11’ x 30’? I like 4’x6’. It is a lot faster, so it seems like a rug instantly appears at the end of the day. But a 4’x6’ is also a size that really resonates with me. I can picture this in a home. Whereas with an 11’x30’, I like how massive it is. And it's really cool to see essentially carpet instead of a small area rug. Meg seaming the border on the mitered-corner rug. What has been your favorite rug? I don’t know that this is my favorite, but it was the biggest challenge for me, and it was a success. It was a mitered-corner rug that was bigger than our loom can weave. They wanted 15 feet wide by 33 feet long. So they wanted a border around the whole rug. We are making a similar mitered-corner rug soon for the same client. The first one was fun because I learned how to problem solve turning a square edge into a mitered corner, and then seamed these mitered corners together to create a border around this gigantic rug. It was a really big challenge, but it worked out and it was really beautiful. The new one is small, only 6x9, I think. So it’s cool to know that they liked the look of the mitered corner. Even though our loom can weave anything less than 12 feet, they just want that look. Do you have any personal weaving projects you would like to share? I wouldn’t say I have a whole lot of projects, more that I have plans. But I do a lot of experimentation and trying to educate myself, like learning to weave fabrics. I’ve spent the last five years teaching myself how to do that. So it's a lot of trying things at home. A lot of things I haven’t turned into anything useable, it’s just stored away as a reference for what I learned. A goal of mine is to learn to weave fabric 45 inches wide so I can cut and sew it into things. I like design, so useful objects are kind of what I’m interested in doing. I have done weaving at home that’s just visual artwork, like tapestry. But for me, I just like functional projects, so I am trying to teach myself how to do that. I have a 45” wide Leclerc counterbalance. Part of the inspiration for rearranging my furniture this weekend was to move my loom to the biggest room of the house. I think that tends to hold me back when weaving at home. If I can’t walk in a straight line, inching around this tiny little room, it’s really hard to work. It’s a big loom for my house. But I love it. What do you do when you aren’t weaving? I like to be outside. I garden a little bit. Any change I get, because I need a partner, we go on really long hikes. Tomorrow we are going out on a grand expedition. That will be all day long. I mostly just like to be outside and go hiking. Would you ever take a small loom on a hike? I’ve really wanted to use a backstrap loom. It's a loom that is set up with the tension around your back. It anchors to one point, like a tree. You have the threads set up around a dowel, and you can roll this up and take it with you anywhere you want, and you just hook it around a tree or a stop sign or something. I’ve never spent a long enough period of time in one place, unless I’m camping. I would like to make one of those and take that out. For Meg’s turn at choosing colors for a Melange rug, she made this bronze runner.